Social media has long reached Aboriginal communities as a major way of communication. How does Aboriginal youth use social media, and is it adequate to learn about death via text message? Aboriginal Australians love using social media. It helps them be in charge, but also connect with loved ones, extend their identity and live culture in new ways. Illustration: Detail from a still from the Australian Communications and Media Authority’s award-winning Be Deadly Online campaign. Aboriginal Australians are enthusiastic and avid users of social media. Facebook and other social media help Aboriginal people connect with others and maintain contact and culture across both vast distances and time, increasing their social connection. Social media benefits Aboriginal Australians in several important ways: identity, power and control, education, culture, and connections. Just as Aboriginal identity has always included a particular language, symbols, images, and membership in exclusive groups, social media extends this identity online. This seems to be one of the most important aspects of social media to Aboriginal people. Historically, indigenous peoples all over the world share the experience of invasion, powerlessness and external control. Present-day governments still do little to allow indigenous peoples to control their own affairs. Social media gives Aboriginal people a sense of power and control over their own decision-making, identities, diversity and communities. It is them who decide what content they produce, who they share it with and when, and, importantly, without any control or regulation from others, especially the non-Aboriginal community and mainstream media which often distorts Aboriginal news. Aboriginal people can represent themselves rather than having others record and represent them. This self-directed power and control has attracted Aboriginal activists who use social networks to inform the world about their struggle. Smartphones have a graphical user interface that uses icons and gestures which is very compatible with a culture that has an oral and visual history. Young Aboriginal people are more drawn to multimedia, video, social networking, animation and music because these minimise language and literacy barriers. People with low literacy can thus understand the technology intuitively because they can remember how to do things spatially  rather than intellectually. Students with inferior English and math skills often still have a very solid grasp of technology. In that respect social media offers alternative forms of learning and literacy such as digital storytelling. Some Aboriginal leaders recognise that the interactions in social networks are similar to ancient imagery and ancient communication channels and serve community and communication just the same. It's a new way of passing on knowledge across generations. Social media is a lot about connection. It is often the primary source of information, but also opens up new groups and better support. Illustration: Australian Communications and Media Authority’s Be Deadly Online campaign. One of the biggest benefits of social media is that it helps connect distant family and friends. When the next community might be as far as 150 kilometres away, users living in isolated areas are increasingly accessing social media via tablet and smartphone devices because services like Facebook offer instant and affordable communication. Social media has the potential to provide a strong sense of community and support for young people. It offers both, communities that Aboriginal people may not otherwise connect with, and a strengthening of existing groups. @IndigenousX is an award-nominated Twitter account which shares Aboriginal knowledge and stories, challenges stereotypes and reflects the diversity of Aboriginal peoples. This sense of support, connection, and community may help improve young Aboriginal people's mental health and well-being, and real-life communities can work together and strengthen their bonds. Online interaction also helps those Aboriginal people who struggle socially or have less social skills to tap into social networks that can support them. The good news with social media is that it helps overcome feelings of isolation which might lead to suicide. People who are connected feel slightly less isolated and if they need help their call can spread fast and wide. They also benefit from better education and health. But given that Aboriginal suicide rates are a national crisis, social media can impose an unrelenting exposure to news about traumatic events, such as deaths in custody and suicide, which can have a huge impact on Aboriginal social media users. Social media has downsides for all users, such as cyber bullying, cyber racism, sexting and the generational gap in knowledge and use. Some challenges however are unique to Aboriginal users. Spread of conflicts. Closely related to the former point, conflicts that previously remained local can spread as young people call, text or inform kin in other places about conflicts, especially via anonymous services such as Diva Chat. Users can also publish posts that are meant to spark violence between feuding families. Pressure about identity. Just like fair-skinned Aboriginal people are challenged by both non-Aboriginal and Aboriginal people because the don't 'look Aboriginal', social media passes on this pressure to 'prove' one's Aboriginality. Even 'being' Aboriginal is often not enough, the community expects Aboriginal users to also 'do' Aboriginality, i.e. by adding mainly Aboriginal users and displaying "knowledge of particular types of language, membership of organisations, participation in certain causes, the sending and receipt of recognisable Indigenous iconography, imagery, the posting of political statements and the knowledge of particular community organisations, structures and practices". Aboriginal Facebook users will check on others if they do. Racial abuse. Memes on Facebook racially vilify Aboriginal people. Discrimination, bullying and vilification via social media can harm Aboriginal social media users, and just like real life abuse they regularly experience online racism. More than a third of Aboriginal people have been the victim of direct racism online. No wonder that the majority of social media users are selective about what they post for fear others would hit back with racism or violence. 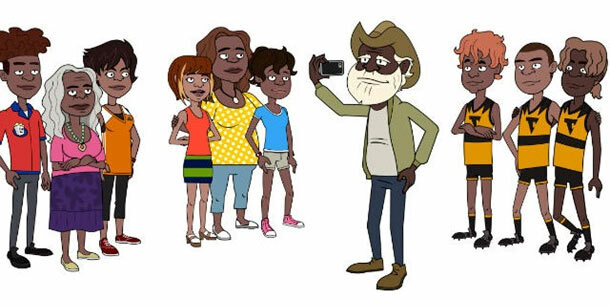 In April 2014, the Australian Communications and Media Authority (ACMA) launched Be Deadly Online, an award-winning awareness campaign around cyber-safety for Aboriginal communities. 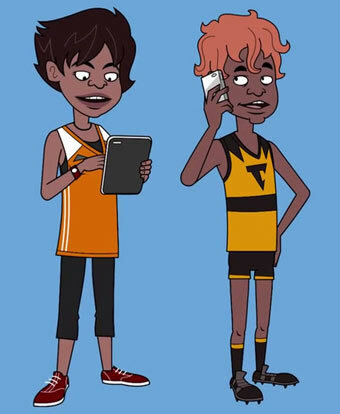 The campaign aimed to tackle complex issue likes sexting, cyber-bullying and managing your digital footprint for a young Aboriginal audience with positive, practical advice on playing smart online. It used a series of short animations, posters and a behind-the scenes ‘making of’ video and offers a collection of classroom resources. Social media mob: being Indigenous online, published by Macquarie University, Sydney, in March 2018, has more information about Aboriginal people and social media. Watch a video by the Office of the Children's eSafety Commissioner educating about how posting videos online can come back and haunt you. Dameyon Bonson is the 2016 Dr. Yunupingu Award For Human Rights recipient and founder of Black Rainbow, Australia’s peak suicide prevention group for Aboriginal lesbian, gay, bisexual, transgender and intersex people. He’s also the managing director of Indigenist, a website about Aboriginal genius, Indigeneity and wellbeing. Joe Williams aims to inspire youth and individuals through motivational speaking workshops, run through his charity The Enemy Within. He is impassioned by the high rates of suicides in Aboriginal communities – speaking and writing powerfully about his own experience of surviving a suicide attempt – as well as the continued discrimination Aboriginal people face in mainstream media. Amy McQuire is a journalist with 98.9FM in Brisbane, the first Aboriginal radio station in a capital city. Amy has a history of being vocal about the injustices faced by Aboriginal people, including talking about hard issues like Aboriginal deaths in custody and police brutality. Jack Latimore is a researcher and journalist with The Guardian Australia, writing on Aboriginal affairs, politics, culture, tech, media and journalism. He is involved in the development of several projects aimed at improving the quality of Aboriginal representation and participation in the mainstream media. Euginia Flynn is a blogger who writes from her viewpoint as an Aboriginal, Chinese, Muslim woman living on Kulin country in Melbourne. Euginia is a thoughtful, poised and strong Aboriginal woman. Professor Bronwyn Fredericks is one of Australia’s few Aboriginal Pro Vice-Chancellors. Aboriginal academics are often referred to as “Blakademics”, and many of them are enthusiastic social media users. Bronwyn promotes issues of health and well-being, race/racism, regional development and more. She is also a supporter of Aboriginal students. Dr Lynore Geia is an advocate for Aboriginal health. She is the founder of Indigenous Health May Day – or #IHMayDay – Tweetfests, which have been successful in gaining national support over three consecutive years and getting Aboriginal health trending on Twitter. Celeste Liddle is the national organiser of the National Tertiary Education Union, freelance opinion writer and social commentator. She blogs at Rantings of An Aboriginal Feminist. Celeste is a strong voice on social media and an advocate for Aboriginal-controlled media, as well as the value of having more Aboriginal commentary in the mainstream media. Dr Sandy O’Sullivan is an academic blogger. She is a great example of the way Aboriginal people are making global connections. She has been to the United States promoting the Batchelor Institute’s Centre for Collaborative First Nations Research. Luke Pearson is the founder of the highly influential Aboriginal media organisation IndigenousX. Luke is also currently a senior digital producer for NITV. The #IndigenousX hashtag started in 2012 as a rotating Twitter account, hosted by a different Aboriginal Australian every week, and has since expanded into other social media. [9a] 'Cyber-Indigeneity: Urban Indigenous identity on FaceBook', Bronwyn L. Lumby, 2010, The Australian Journal of Indigenous Education, vol.39, no. Supplement, pp. 68-75.